Evidence traces the existence of bagels all the way back to ancient Egypt, but popular belief suggests our favorite ring-shaped doughy delights are a product of Poland. No matter the origin, the bagel is a thing of beauty: A chewy, golden brown sheen of the properly boiled-and-baked roll-with-a-hole. And Big Sky Country hosts a few very good artisan bagel shops. Here are our six favorites! Really good bagels are hard to find outside New York, let alone across the continent in the Inland Northwest. Part of a welcome bagel-boom in the early 90s, founder Sue Thompson filled the void in Missoula, employing her son as the inaugural baker. Per the shop’s focus on quality and the responsibly-sourced, these never-frozen morels are hand crafted and certified organic/non-GMO. A plethora of flavors ebb and flow with the seasons. If an establishment is going to focus on only two things, they better do them right. And this couldn’t be any more important than in the realm of bagels & coffee. This Bigfork institution grinds their beans fresh, in house, and serves hot and toothsome bagels from local Montana craftsmen. 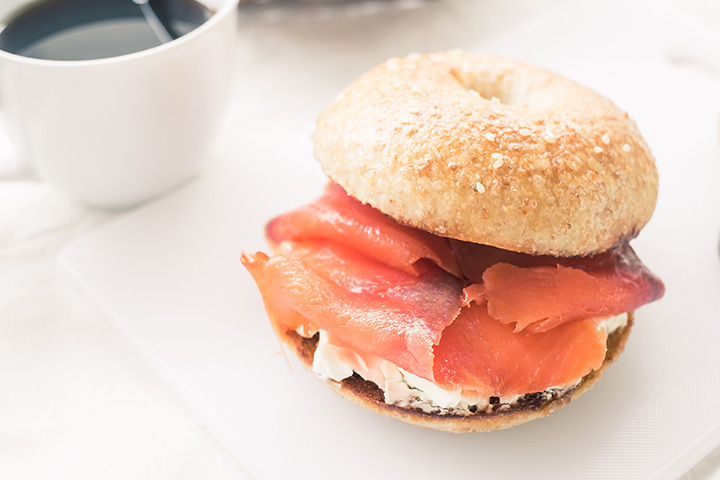 The savory combinations of breakfast and lunch sandwiches (on bagels, of course!) make Buzz a morning, or afternoon, necessity. A favorite formula is a simple one: Roasted turkey, pesto cream cheese, cranberry bagel. Twenty-five years into their tenure, the bakers at the ‘Works continue to crank-out house-made bagels, baked fresh daily. Warm and chewy bagels are sold by the each or dozen, coming in fourteen varieties, including cranberry and cheddar-jalapeno. The signage is certainly colorful, but it gets the point across: “fresh baked bagels” and “good coffee.” Enough said. This proudly diner-drab establishment is a solid breakfast and lunch stop, where all the focus is on the all-important bagel. Varieties are hand crafted: Soft and chewy, with just enough give. By the bag or mounded with toppings for a sandwich, Great American satisfies. There’s the ubiquitous breakfast bagels, with bacon and melted cheddar, or the simply toasted with cream cheese. The Reuben melt and bagel-wrapped hot dogs are delicious in-house novelties, or add bacon to a cucumber-cream-cheese-laden roasted turkey. This breakfast/brunch spot has a warming combination of freshly-baked bagels and morning cocktails. A full breakfast menu with pancakes and steak & eggs centers around “23 Kinds of Fresh Bagels.” Alongside a refreshingly-spicy Bloody Mary, the bagel sandwiches enliven the spirit: that hallowed alchemy of bacon fat and chewy gluten, black pepper, tomato and the subtle sting of vodka. Supposedly, it’s all healthy. Maybe, maybe not. But they only way to find out is to pay Bagels Etc. a visit.